Among several outstanding features that make Gift Card extension be loved by a large number of both admins and shopping doers, gift card design for both users and customers seems to be the most favorable part. This function allows store owners to manage the structure of the card produced as well as enables buyers to personalize their own certificate in details. If you want to have a clear understanding about this incredible function, find it below now. Have you ever imagined being a designer one day only by simple actions like drag and drop? Yes, here you can do it for sure. Drag and drop are really easy actions that shop admins can do to make a card structure by themselves. In other words, how the cards look like all depend on admins’ arrangements. If a store is equipped with Mageplaza Gift Card extension, store owners can configure gift voucher template easily and quickly in backend. 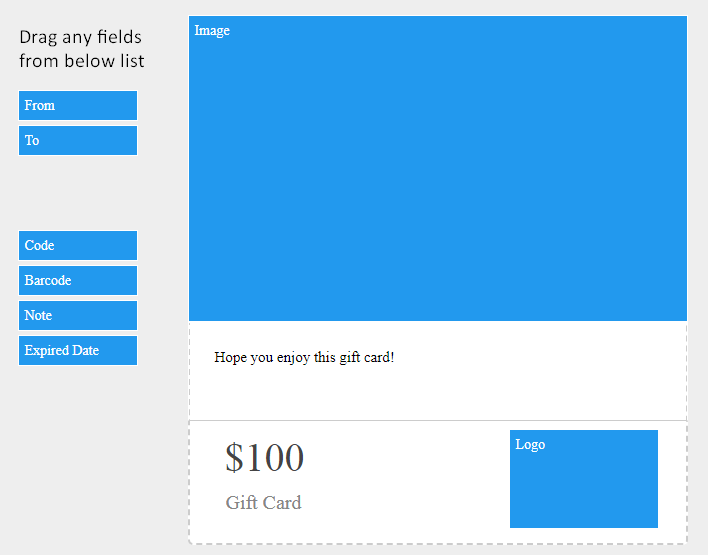 To start making your own gift card styles, you have to navigate design configuration in backend from Store > Configuration > Manage Template > Create New Template > Design. Then select one theme to upload default template from Load From Exist Template. After default template is loaded, you can start making adjustments certainly by drag and drop. On the left hand of the Design Template box, there are several fields for you to add into your cards such as Logo, Title, Image, From, To, Value, Code, Message, and so on. If you want any fields to be presented on the certificate, move the mouse to this field, click and hold, then drag it to the position that you want, and finally drop this field. This action can be done to any field and it can be put anywhere. Customers after selecting the theme of the card will be moved to another page where they can start personalizing their own cards. In the Gift Card Design, consumers will see a bundle of templates created by admins and choose among those the most favorable one. If they want to use another image, they can click on Upload image to get pictures from their devices. Once they finish choosing templates, buyers are required to provide necessary information on the right side fields. When they fill in these boxes, buyers are enabled to preview their cards designed on the left hand of the page. Therefore, if they find out any incorrect information, they can easily make changes. Since shopping doers are allowed to take a glance at their cards before checkout, they know exactly what is going to be sent to their family or friends.